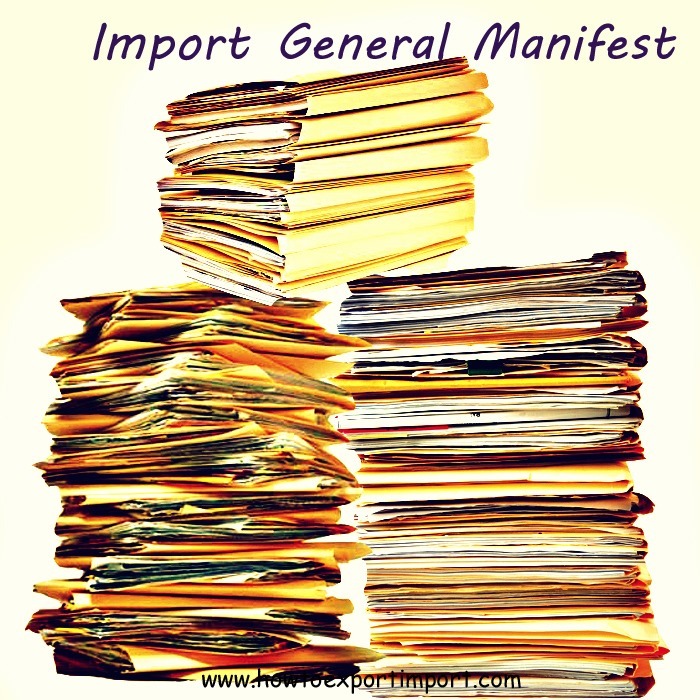 What is IGM – Import General Manifest? How does Import General Manifest work? Who has to file IGM? What are the contents of an Import General Manifest IGM? When does IGM file? Where to be filed Import General Manifest? If any goods arriving to your border of country is called imports. Generally, imports are by air or sea. Once after arrival of goods at airport or sea port, the imported goods are moved to a Customs bonded area situated at a destination customs location. Without the permission of customs department, the said imported goods are not permitted to move out of the said bonded area. The importer has to complete necessary import customs clearance procedures and formalities to take delivery of imported goods. Once after completion of such import clearance procedures, customs permits to move goods out of the said customs bonded area. When can an importer or his customs broker file import customs clearance documents at a customs location? Importer or his customs broker can file import documents for clearance, only after filing of IGM Import General Manifest. 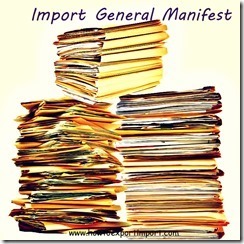 Who files Import General Manifest? The carrier of goods are responsible to file Import General Manifest at a destination customs location where import cargo off loaded. Filing of IGM is mandatory and legal obligation to government through customs department. The carrier has to intimate customs department of respective country about the complete details of arrival of goods. This intimation is filed in a specified format instructed by customs department. Accordingly the carrier of goods files the details of cargo in specified format with customs immediately up on arrival of goods. What are the contents of Import General Manifest? Import General Manifest contains the details of each shipment arrived at a specified customs location. Each IGM has to be filed at each customs location where the imported goods are moved. The Import General Manifest contains the serial number of shipment which is called Line Number of said IGM, name and address of importer, nature of goods, quantity of goods with number of packages, port of loading, country of loading, shipper’s details, container number if any in case of sea FCL imports etc.etc. When is IGM filed by carrier of goods? The carrier of goods has to file Import General Manifest immediately up on arrival of goods. The IGM also can be filed before arrival of goods. However, the details of arrival of imported goods have to be matched with actual arrival of goods at the destination customs location. Once after filing import general manifest, the importer or his appointed customs broker files Bill of Entry with customs department to complete the customs procedures to take delivery of cargo. Once the procedures and formalities completed, the goods is ‘passed out of customs’. The importer can take delivery of goods with the permission of carrier. In this article, I hope I could explain about Import General Manifest in simple language to make you understand easily. Do you have different thoughts about IGM in international shipping terms? Do you wish to add more information about Import General Manifest in export import trade of International Business? Share your experience about Import General Manifest – IGM. Comment below your thoughts and discuss about Import General Manifest in import export trade of International Business. GST slab rate on sale or purchase of Machines for milling industry. Sreedhar: On 23 August 2013 Very precise explanation, thank you. KAMAL KUMAR: On 06 February 2014 Dear Sir, We have imported goods from Indonesia and the terms is CIF Nhava Sheva and place of Delivery is ICD Tughlakabad, the same has been clearly mentioned on the Bill of Lading, moreover the agent address is also mentioned on the B/L is of New Delhi, the Shipping Company filed the, when we track the B/L from net and found that the Cargo reached at Nhava Sheva on 20.01.2014, we sent a mail to them for providing Rail out details from Nhava Sheva to ICD Tughlakabad, but surprisingly the Shipping Company replied that they have filed the IGM at Nhava Sheva, and they said that they have done upon the Instructions from Shipper, we requested them to show us the mail/communication from shipper, which they failed to do so. Till date we are requesting them to move the Cargo from Nhava Sheva to Tughlakabad, they are making lame excuses on one pretest or the other in order to monetary gain of detention charges, after our regular follow up with shipping company, they replied that they shall confirm from the Load Port, and wasted 4 days in that also, thereafter they said that they have confirmed from their Load Port and shipper, and the shipper has no objection if the goods are to be delivered as per the wish of consignee, but the charges shall be borne by the consignee, on the other hand, we shall have to bear the rail freight if the cargo reached at Nhava Sheva, as the shipping Co. does not issue the DO unless their all charges are paid. Thereafter the Shipping Co. instructed us to surrender the B/Ls with their New Delhi Office and intimate them and they shall amend the IGM on our behalf. But now they have sent formats for amendment in IGM and asking for documents viz. Invoice, Packing List, IEC and request letters on our letter head addressed to Deputy Commissioner of Customs, from us, which means that apart from the money, it will prove our mistake and we are deliberately want to amend the IGM, whereas it is the mistake on the part of Shipping Company, they should amend the IGM on their own and should also bear the expenses and they are now unnecessarily harassing us. Please asvise. Kamlesh Yadav: On 19 November 2016 Pls guide me if our company has obtained a certificate of Amendment through customs under post EDI S/Bill and it will be seen in online window of DGFT? How can we claim those S/bills in MEIS ?